Recently in the media, there have been many messages of doom and gloom about the economy. It is tantalizing to hear people talk about the 'green shoots of recovery' and it made me wonder when a breakthrough might come, which is how I decided on my title - When? The rough and smooth textures and the dark and bright colours mirror the changing fortunes if today's economic climate. I have used tissues, gesso and paints to create rough and dark textures of the underground roots. I have used a number of methods for the newspaper headlines: sewing the newspaper directly onto the quilt and also scanning the text into the computer before printing onto fabric. I layered up different organza colours and then cut back the layers to create a gradation of colours from dark to bright (dark times to a brighter future). 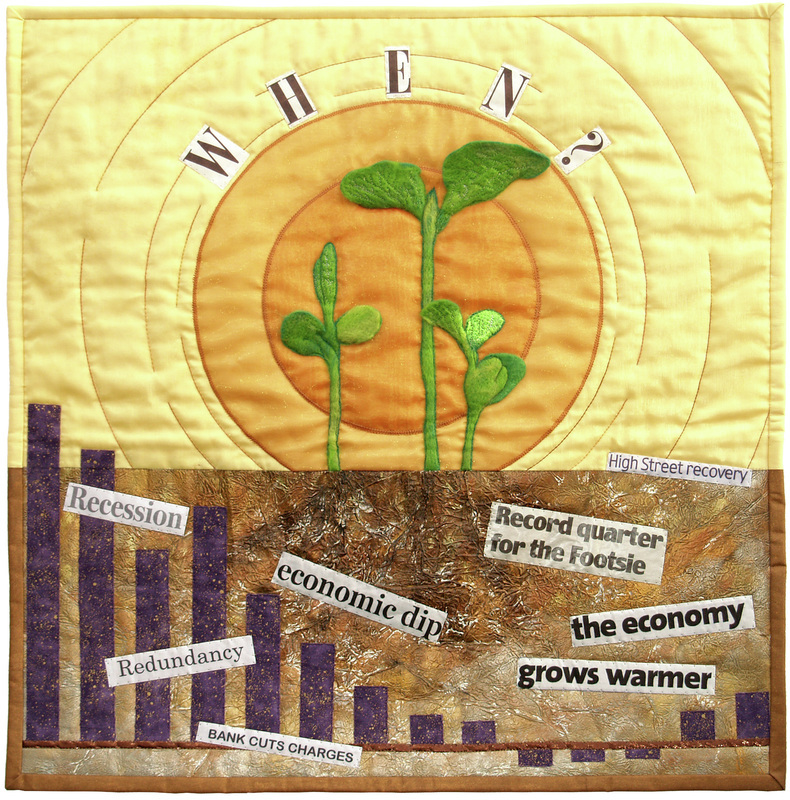 The green shoots themselves were dry-felted using wool fibres and organza with an embellisher machine Finally the headlines and the histogram were appliqued onto the quilt. Materials: wool fibres, organza, paper, gesso and paint. Techniques: felting, applique, printing and scanning, stitching.